Now that spring is *technically* here, perhaps you’re dreaming about renovating your home’s exterior to take advantage of the sunny, warm weather once it arrives! Building a deck or a patio is a great way to do this, giving you a place to relax outdoors with family, friends or solo in peace and quiet amongst nature. From barbeques to birthday parties and more, these are great spots to host events or unwind with a cool drink on a lovely day. However, building the perfect deck or patio involves a lot more than just calling in a team of builders or handymen – it also means that you need to consider what’s going into the overall renovation. This includes how it will hold up over time, whether it is designed and built to meet your needs, and whether or not you can achieve the perfect completed project within your budget. To do this, it’s a good idea to take a look at what the benefits are of choosing either a deck or patio. Owning a deck allows for plenty of room to stretch out and enjoy the great outdoors just steps from the comfort and conveniences of your home. They also offer higher resale value, especially for wooden decks that are extremely popular and durable. They’re perfect for getting outdoors and enjoying your yard (even if you have uneven terrain) and provide a great view by being lifted off the ground. 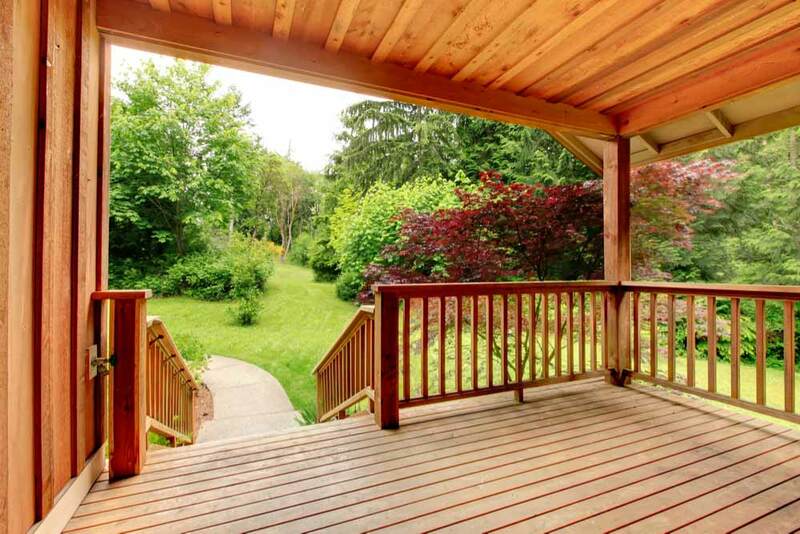 Wooden decks in particular can naturally absorb and retain heat very well. Depending on which material you use for your deck – wood, concrete, brick or stone – you may encounter varying degrees of susceptibility to rotting, breaking down, or decaying, and will need to perform more maintenance. Some decks require a permit, particularly if they are large or incorporate a unique design, and they generally cost quite a bit more per square foot when using high-end decking material. There are also weight restrictions due to the strength of a deck’s supports, which can vary depending on the materials used. Inexpensive and budget-friendly, patios are a great cost-effective alternative to a deck – even if you use more expensive materials such as brick or flagstone! This is due to there being less of a need to worry about the cost of supports, with patios generally built on lower and more flat areas. They also offer more privacy, don’t require a permit, and are easier to maintain especially since they can be sealed. If you’re looking for a cost-effective way of enjoying the outdoors at home without splurging for a more expensive deck, a charming patio is the way to go. While patios are relatively inexpensive, they are prone to developing cracks, stains, and warping, particularly if the ground isn’t perfectly level and inspected prior to construction. They can also take longer to install in areas where there is a lot of ground movement, requiring more reinforcement and delaying the process. Additionally, ice can easily form on the surface of a ground-level patio and surfaces are more susceptible to staining and cosmetic damage as a result. If you’re planning on building a deck or patio, it’s a good idea to also think about what you’ll actually use it for. It could end up that a cheaper option suits your use case better, helping you save on money, time and valuable space! Take a look at your property’s layout and consider whether a covered or exposed addition makes more sense for your needs and budget, and try to plan according to how much use your deck or patio is actually going to get. Weighing the pros and cons should also be prioritized as well, helping you understand the true value of the renovations to come. Whether you’re considering a deck or patio, be sure to consider which one is appropriate for your property. Factoring in the landscape levelness, inclement weather, and your budget can go a long way in ensuring you make a sound investment that can be enjoyed for years to come. Be sure to choose the right materials for your needs as well, and don’t forget to choose a trustworthy, experienced team to take care of your renovation properly!